Our 8:00 worship services are held in the historical chapel. Swift Presby­terian Church was built in the early 1900s. The old church is now a historical landmark. Swift Church has a congregation of 188 active members and a church family of 244. From the large groups of young adults to retirees, God has kept the historical family atmosphere and blended it with a fresh breath of life. The only thing that takes precedence over the warm, loving relationships at Swift is the willingness to serve God and His will. All are welcome at Swift Church, just as all are welcomed into Christ. Please see below for the interesting beginning of this growing church. ►Here is an interactive 360-degree tour that enables you to explore and celebrate the chapel and proceed through the fellowship hall and kitchen. At the turn of the 20th century, in the waning years of the Victorian Era, Sandy Creek was a small but bustling community without a church. Most of the settlers who lived in the area worked for the logging operation owned by George Robinson and managed by C.A. Swift. It was to this community that Mr. Swift brought his bride, Mobile native Susie P. Roberts. It wasn’t long before several members of her family, including Byard Roberts, Mrs. G.E. Gavin and her sister, Miss Cornelia Roberts, came to settle here as well. Miss Cornelia desperately missed her church. On Sunday, she and the family youngsters would walk up the hill to the spot where our church now stands and she would tell them of her dream of building a church someday. As the logging operation around Sandy Creek began to play out, many of the settlers moved away, but Miss Cornelia’s dream remained strong. In 1905, her dream began to take shape with land and lumber donated by C.A. Swift and gifts and donations from other relatives and friends. 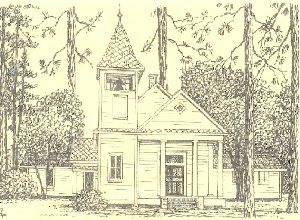 The building was completed in 1907, and originally named “The Little Church in Piney Woods.” Three years later, Swift Church was formally organized by the Presbytery of Mobile. Miss Roberts was elected to serve as deaconess of the church, which bears the name of its primary benefactor. The congregation of Swift Presbyterian Church has grown over the years and constructed a new sanctuary, but our beloved little wooden church with a deep, rich history still stands and functions as an alternate chapel. 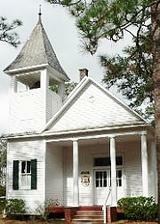 ►Historic churches of Baldwin County video. Click to watch. The Swift portion starts at 20:30. She could not have known the ultimate effect of her actions as she crossed the small creek just east of her home. I feel certain she was seeking a place of quiet solitude where the influences of her responsibilities could be pushed aside for a short while. Her intent was most likely not just to get away alone to collect her thoughts, but also to pursue a closer unity with her Creator. One could imagine, as she walked the shallow hill on the other side, she could hear the gentle breeze creating a low whisper as it was blowing through the long needles of the towering pines. The pines were in a continuous renewal process of dropping the browned needles to make way for new growth. The ground was so covered that scarcely a weed could grow. As Cornelia Miriam Roberts walked a little farther into this most peaceful setting, I’m certain she found exactly that for which she had been seeking. She would return, time and time again. I suppose this glade became her Eden, a place where she could walk with God. Miss Roberts was from Mobile, Alabama, where she had attended the Government Street Presbyterian Church. Her sister Susie Roberts married Mr. Charles A. Swift, who was the manager of a logging company operating in Miflin around the turn of the 20th century. Several members of the Roberts family made the move from Mobile to live in Miflin during these times. When her brother, Platt Roberts, died, his wife and five small children moved to Miflin as well. Miriam welcomed the company and lovingly cared for her brother’s children by providing them with Sunday School. On Sunday afternoons, she would take them up the hill to her favorite spot and tell them of her dream of building a church there among the pines. After a couple of years, the Platt Roberts family moved back to Mobile. Miriam was alone once more, but she still dreamed of having a church. Miriam’s dream reached the ears and heart of her brother-in-law, Mr. Swift, whereupon he generously gave her the land of her vision and the lumber with which to begin construction. The project was begun in 1905 and completed in 1907. It was a difficult undertaking for Miriam, but she had taken on the challenge and had the fortitude to prevail. Services were held in the church for three years before being officially sanctioned and dedicated by the Mobile Presbytery in 1910. Miss Roberts was elected one of the first members of the board of deacons of the church, since there were not enough available men. It is apparent from historical records that she was the cohesive element that would keep the church in continuing progress. I believe her dream and vision was to become the legacy from which many would benefit, including myself. The building was pristine white with a front, portico-like, entrance to a small chapel. A bell tower with steeple was on the left front. The new church was given the name of Miss. Roberts’ brother-in-law to honor his generous contribution. Thus, Swift Presbyterian Church was born.